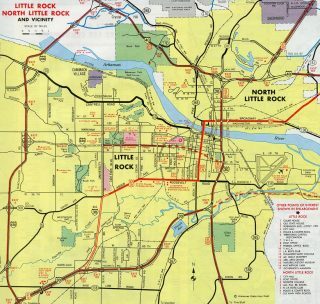 Interstate 630 stretches across the city of Little Rock from the western suburbs to University Park, Forest Hills, Capital View and Downtown. The western end is the Big Rock Interchange, named for a large rock formation unearthed during 2009-15 reconstruction of the exchange with I-430 and Chenal Parkway. The eastern terminus at I-30 and 15th Street lies between MacArthur Park and the Hanger Hill Historic District. An 880 foot long viaduct spans the Union Pacific (UP) Railroad, Thayer and Rice Streets at Capitol Hill. East from there, I-630 drops below grade to the south of the Arkansas State Capitol. Interstate 630 (Wilbur D. Mills Freeway) was constructed along the proposed alignment of the “Eighth Street Expressway.”1 Construction began in the 1960s, with the initial section completed between Cedar/Pine Streets and the viaduct across the UP Railroad by 1971. 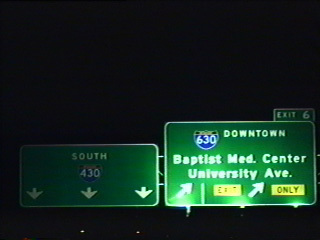 The succeeding segment extended I-630 west to University Avenue by 1976. Interstate 630 ran east from University Avenue to the Arkansas State Capitol at Park Street in 1976. Construction lengthened the route west to I-430 in 1977. Interstate 630 (Wilbur D. Mills Freeway) navigates below the Downtown Little Rock street grid east to the multi level interchange with I-30 (Exit 139) and 15th Street (Exit 1). Photo taken 05/07/12. Entrance ramps add traffic to I-630 east from Louisiana and Cumberland Streets on the half mile preceding Left Exit 1 for 15th Street. Photo taken 05/07/12. A pedestrian bridge spans Interstate 630 from MacArthur Park at the ramp departure (Exit 1) to 15th Street. 15th Street extends east from College STreet through the Historic Hanger Hill District. Photo taken 05/07/12. Interstate 630 concludes with a two lane ramp (Exit 139B) joining I-30 west to I-530 for Pine Bluff and I-440 east to LIT Airport. Two lanes connect with the final 3.2 miles of I-30 east to I-40 in North Little Rock. Photo taken 05/07/12. 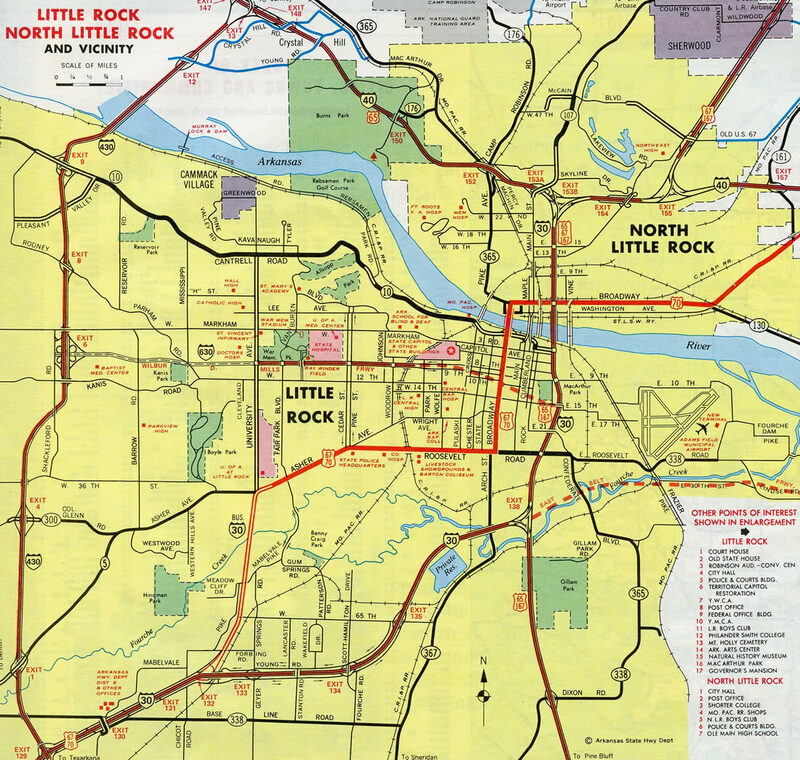 Traveling north from the systems interchange with I-440 (East Belt Freeway) and I-530, Interstate 30 combines with U.S. 65/167 to Arkansas 365 (Roosevelt Road) and Downtown Little Rock. Photo taken 05/07/12. The entrance ramp from Highway 365 (Roosevelt Road) forms one of the two lanes for the flyover (Exit 139B) to Interstate 630 (Wilbur D. Mills Freeway) westbound. Photo taken 05/07/12. Entering the directional T interchange (Exit 139B) with Interstate 630 west on I-30 & U.S. 65/167 north. Photo taken 05/07/12. 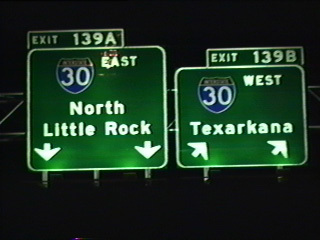 Interstate 30 westbound crosses the Arkansas River from North Little Rock ahead of the first of three Downtown Little Rock interchanges (Exit 141A). Photo taken 05/07/12. Highway 10 stems west from Exit 141A to La Harpe Boulevard along the Arkansas Riverfront. I-30 proceeds south a half mile to Interstate 630 (Wilbur D. Mills Freeway). Photo taken 05/07/12. Succeeding ramps link Interstate 30 westbound with 6th and 9th Streets west into the Little Rock central business district and I-630. Photo taken 05/07/12. 9th Street runs along the north side of MacArthur Parkway west of I-30. Interstate 630 passes south of the park as it drops below grade. Photo taken 05/07/12. A lane drop occurs along I-30 westbound beyond the 9th Street overpass for Interstate 630 west (Exit 139B). Photo taken 05/07/12. 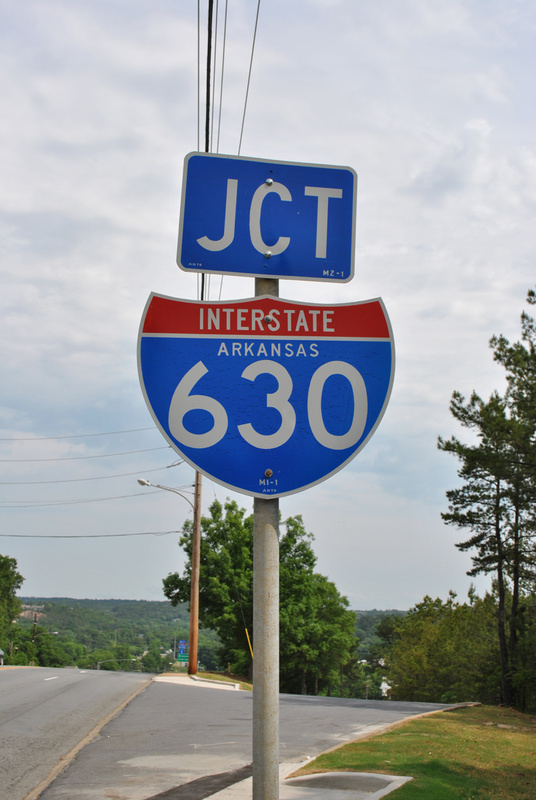 Interstate 630 westbound parts ways from I-30 to west Little Rock. 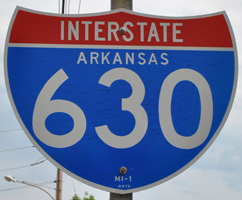 Interstate 30 continues southward to Arkansas 365 (Roosevelt Road), the former alignment of U.S. 65 through Little Rock, and the split with I-530 south to Pine Bluff. Photo taken 05/07/12. Interstate 630 ends one mile west of the diamond interchange (Exit 6B) with Barrow Road. Photo taken 05/07/12. The Big Rock Interchange project reconfigured the remainder of I-630 west from Exit 7. Exit 8A for I-430 south now departs from within the trumpet interchange for Baptist Health Medical Center. Photo taken 05/07/12. A full cloverleaf interchange previously joined I-630 with Interstate 430. The freeway ended at a signalized intersection with Shackleford Road and Financial Centre Parkway. Photo taken by Chris Patriarca (05/03/03). A c/d roadway was constructed along I-630 westbound for the loop ramp (Exit 8B) to Interstate 430 south and Shackleford Road. Shackleford Road parallels Interstate 430 north to West Markham Street and south to Kanis Road. Photo taken by Chris Patriarca (05/03/03). Overpasses were constructed above the intersection of Financial Centre Parkway and Shackleford Road pictured here. Chenal Parkway extends west from Financial Centre Parkway through West Little Rock to Shady Grove.Photo taken by Chris Patriarca (05/03/03). Interstate 430 crosses under Shackleford Road a half mile ahead of the cloverstack interchange (Exit 6A) with I-630 east and Financial Centre Parkway west. Photo taken 05/20/14. The Big Rock Interchange project separated Exit 6A from the preexisting c/d roadway with I-630 and added a distributor roadway east for Baptist Health Drive. Photo taken 05/20/14. Exit 6B leaves I-430 north for Baptist Health Medical Center and Downtown Little Rock. Exit 6B follows as the c/d roadway for Financial Centre Parkway west to Chenal Parkway and Shackleford Road north to Markham Street. Photo taken 05/20/14. The original c/d roadway for I-630 and Financial Centre Parkway separated from Interstate 430 north at the Kanis Road overpass. Photo taken by Chris Patriarca (05/03/03). The previous separation along the c/d roadway at Exit 6 for Interstate 630 (Wilbur D. Mills Freeway) east. Photo taken by Steve Hanudel (08/18/05). Four lanes continue south from Rodney Parham Road (Exit 8) toward the Big Rock Interchange with Shackleford Road and Interstate 630 east. Photo taken 05/20/14. The c/d roadway at Exit 6 connects with Shackleford Road north to Financial Centre Parkway and the distributor roadway along I-630 east for Baptist Health Drive (Exit 7). Photo taken 05/20/14. Crossing over the ramps linking Financial Centre Parkway with Interstate 630, the loop ramp for Wilbur D. Mills Freeway east to Downtown leaves the c/d roadway. The Arkansas State Capital lies six miles to the east. Photo taken 05/20/14. The collector distributor roadway for parallel Shackleford Road and I-630 east partitioned from I-430 south at the Markham Street overpass. A two lane flyover for Interstate 630 was constructed here during the Big Rock Interchange project. Photo taken by Chris Patriarca (05/03/03). The previous off-ramp for Shackleford Road was realigned to connect with the parallel road northbound. The forthcoming loop ramp for I-630 east was expanded to include a connection with Shackleford Road south of Financial Centre Parkway. Photo taken by Chris Patriarca (05/03/03). “Big Rock Interchange Fact Sheet.” Arkansas Department of Transportation (ARDOT). “Big Rock Interchange dedicated.” Arkansas Democrat Gazette (Little Rock, AR), July 8, 2015.